South Korean auto major, Kia, has officially revealed its 2013 Sorento CUV (Crossover Utility Vehicle). The car will now be made available in US with various changes and new fittings compared to the earlier model. 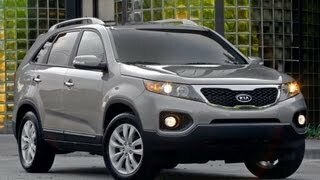 In the US, the 2013 Sorento will be made available with a front bumper that seems to be inspired from the Cerato coupe from Kia. This new front bumper gives the 2013 Sorento a pretty aggressive and bold look, especially from the front. At the same time, the car has some elegant elements built into it. The front fascia of the new Sorento includes long and narrow headlamps, a pair of uniquely designed fog lamps, heated side-mirrors with integrated signal indicators and a rather rounded nose. The car has been given new 17-inch alloy wheels fitted with 235/65R17 tires. The SX variant, on the other hand, 18-inch wheels along with chrome tipped exhaust. The probable buyers of the 2013 Kia Sorento will be given three engine options to choose from. The first option includes a 2.4 liter MPI 4-cylinder engine with a peak output of 175 HP and a peak torque of 169 lb-ft. Next comes the 2.4 liter GDI 4-cylinder engine with a peak output of 191 HP and a peak torque of 181 ib-ft. This particular engine has a fuel efficiency rating of 32mpg on the highways. The third and the most powerful engine option includes the 3.5 liter V6 engine with a peak output of 276 HP and a peak torque of 248 lb-ft. All the three engines will be integrated to a 6-speed automatic transmission with Sportmatic Shifting Control as standard feature. 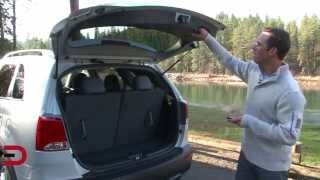 Kia describes the interiors of 2013 Sorento CUV as being ‘tech savvy’. The LX version will have standard features like tilt/telescopic steering wheel with built-in audio controls, air-conditioning, power windows and illuminated vanity mirrors. Shell out some extra bucks and you will have things like eight-way power driver’s seat, leather covered steering wheel and a first aid box as part of the Convenience Plus Package. On the EX version, one will have leather wrapped seats as well as automatic dial zone climate control as standard features. Finally, the most lavish SX variant will have all the features of the LX and EX variants and will add to it things like four way passenger seats, auto dimming rear view mirrors, stainless steel pedals and much more. The price and availability of the vehicle has not been revealed yet by Kia. As soon as they are declared, Dieselstation will bring them to you. IRVINE, Calif., February 27, 2012 - The Kia Sorento compact crossover utility vehicle (CUV), which is built at Kia Motors' U.S. manufacturing plant in West Point, Georgia, enters its third model year supported by an impressive list of accolades and sales milestones. Since its launch, Sorento has offered discerning consumers a refined and value-minded CUV with class-leading power and fuel efficiency while delivering a full roster of standard comfort and convenience features and an impressive array of safety equipment. For 2013, Sorento's utility and functionality are boosted further by adjusting content to suit consumer needs more than ever before. Among the enhancements, the 2013 model year brings newly standard leather seating for the mid-level EX trim and a newly standard third-row seat for the LX V6 trim. In addition, the base LX trim now offers the optional UVO powered by Microsoft®4 voice-activated infotainment system based on the Windows®4 Embedded Automotive platform. Available later in the model year is a new, more robust LX Convenience Plus Package, including an eight-way power driver's seat, leather-wrapped steering wheel and shift knob, and a First Aid Kit for family-minded consumers (First Aid Kit also added to all EX/SX Premium option packages). Sorento employs a unibody design with the ability to comfortably seat up to seven passengers, and represents a modern CUV that is just the right size for today's consumer. With an overall length of 183.9 inches and overall width of 74.2 inches, Sorento offers occupants a spacious interior, while providing a relatively compact exterior size. Prominently displaying the signature grille and wraparound headlamps exhibited on all newer Kia models, Sorento offers an aggressive stance and sleek profile. Sorento features swept-back lines and dynamic presence with an angled window line, large flared-back headlamps, prominent fog lamps and rounded nose, while the view from the rear offers the same forceful attitude with a rounded back and tail lamps set powerfully within the rear lift gate. The Sorento CUV is available in LX, EX and SX trim levels. The versatile Sorento offers standard 17-inch alloy wheels with 235/65R17 tires and wheel moldings and body-color, heated outside mirrors with integrated LED turn signal indicators. The EX trim offers an 18-inch five-spoke hyper finish wheel outfitted with 235/60R18 tires plus fog lamps, roof rails and a rear spoiler. EX trims offer an optional panoramic sunroof (V6 models only). Advancing to the more refined SX trim adds mirror-finish 10-spoke 18-inch alloy wheels, chrome-tip exhaust, body-color wheel well molding, stainless steel under bumper trim accents and step pad, sleeker body-color front and rear bumpers and LED tail lamps for a decidedly more upscale appearance. 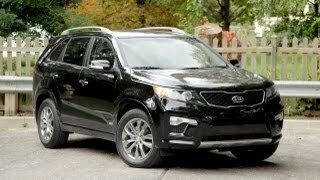 The Sorento provides a feeling of spaciousness with both five- and seven-passenger seating configurations, making the Sorento more versatile than most of its compact CUV competitors. With 142.5 cubic feet of interior volume when equipped with five seats or 149.4 cubic feet with seven, Sorento is spacious with generous head and legroom for optimal occupant comfort. In the five-passenger configuration, the CUV offers 37 cubic feet of cargo space to accommodate both passenger and cargo needs for cruising around town as easily as weekends camping in the mountains. In addition to a comfortable ride, an impressive slate of technology features also come standard, including an AM/FM/CD/MP3/Sat audio system with SiriusXM™ Satellite Radio5, auxiliary and USB audio input jacks for connecting personal MP3 players, and Bluetooth®6 wireless technology connectivity with steering wheel-mounted voice activation controls to enable hands-free operation for all compatible mobile phones. Standard equipment on EX models such as UVO Powered by Microsoft, push button-start ignition with smart key and rear sonar back-up sensors, rear view back-up cameras7 and air ionization purification technology complete the modern and high-tech driving experience. Moving to the SX trim offers a standard voice-activated navigation system with SiriusXM Traffic™ while also adding an upgraded Infinity®8 surround sound system with 10 speakers for superior listening enjoyment. Standard amenities for the LX trim include air conditioning, a tilt and telescopic steering wheel with integrated audio controls, automatic up and down driver's window function, illuminated vanity mirror, EcoMinder™ Indicator to assist with fuel-efficient driving habits and three-row seating (LX V6). Progressing to the EX trim provides even more well-appointed standard features, including newly added leather seating, dual automatic temperature control and rear air conditioning (V6 models only). SX trims add touches of sophistication with an automatic dimming rear view mirror with Homelink®9, memory driver's seat, four-way power passenger seat and ventilated/cooled/heated front seats (optional on EX), leather seat trim for the first and second rows, stainless steel pedals and a stainless steel sill plate with illuminated scuff trim. Able to suit practically any driver, Sorento offers the discriminating consumer specific package options. The Convenience Package, available for the LX trim, includes the UVO infotainment system with integrated rear view camera display, roof rails, rear sonar, an auto-dimming mirror with compass readout, heated front seats and fog lamps. Later in the model year, a new Convenience Plus Package will be offered, including eight-way power driver's seat, leather-wrapped steering wheel and shift knob, floor mats and First Aid kit. Moving to the Premium Plus Package (EX four-cylinder) adds a power passenger seat, three rows of seating and a host of other amenities. Further adding to the feeling of spaciousness is the available panoramic sunroof (EX V6 and SX trims only). By upgrading to the Limited Package (available for the EX V6 trim), owners will benefit from luxuriously appointed features, including a voice-activated navigation system10 with real-time traffic, an Infinity premium surround system with 10 speakers and a 550-watt digital amplifier, power folding outside mirrors, memory driver seat and side mirror position and an air-cooled driver seat for added comfort and convenience. 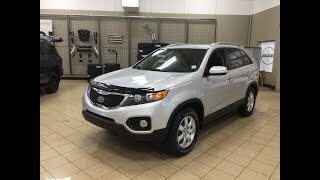 The 2012 Sorento offers three engines – an advanced 2.4-liter GDI four-cylinder engine providing class-leading 191 horsepower and 181 pound-feet of torque and a class-leading fuel efficiency rating of 32 mpg/highway3; a 3.5-liter V6 providing class-leading 276 horsepower2 and 248 pound-feet of torque; and the affordable 2.4-liter Multi-Port Injected (MPI) four-cylinder engine producing 175 horsepower and 169 pound-feet of torque. All engines are coupled to a six-speed automatic transmission with Sportmatic™ shifting control. This advanced six-speed automatic transmission is a proprietary design that was developed, engineered and built specifically for Kia vehicles. To further meet consumer needs, there is a choice of either front- or all-wheel-drive configurations, the latter coming with a locking center differential to evenly distribute power to all wheels while operating the vehicle at low speeds during more severe weather conditions. For enhanced ride performance, the Sorento employs a compact and light MacPherson strut front suspension and a fully independent multi-link rear suspension. 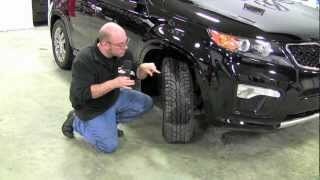 Like all Kia vehicles, the 2013 Sorento is equipped with a plethora of standard safety equipment. All trims come outfitted with driver and passenger advanced front airbags, front seat-mounted side airbags, first and second row side curtain airbags and front active headrests, four-wheel Antilock Brake System (ABS), Electronic Stability Control (ESC) and Electronic Brake Distribution (EBD). Hill Start Assist Control (HAC) and Downhill Brake Control (DBC) also come standard on all models, the former assisting in preventing the vehicle from rolling backward when trying to pull away from an uphill gradient, while the latter helps keep the vehicle moving straight and steady down steep grades. The 2013 Sorento is covered by Kia's comprehensive warranty program11, which offers consumer protection at an exceptional value. Included in this program are a 10-year/100,000-mile limited powertrain warranty, a five-year/60,000-mile limited basic warranty and a five-year/100,000-mile anti-perforation warranty. A five-year/60,000-mile roadside assistance plan also is part of the comprehensive vehicle coverage. Kia Motors is the one of the world's fastest moving global automotive brands; from 2009-2011 Kia launched more new vehicles in the U.S. than any other automaker, and under the guidance of chief design officer Peter Schreyer earned a reputation as an industry leader in automotive styling. Kia Motors America's full line of fuel-efficient and fun-to-drive cars and CUVs has earned critical acclaim and dramatically increased consumer awareness, perception and consideration for the brand. In 2011, KMA recorded its 17th consecutive year of market share growth, thanks in part to the largest increase of any major brand in perceived quality and the industry's highest brand loyalty ranking13. Kia's U.S.-based manufacturing facility in West Point, Georgia – KMMG – is responsible for the creation of more than 10,000 plant and supplier jobs and builds the company's two best-selling vehicles in the U.S. – the Sorento CUV and Optima midsize sedan14. Kia's value and technology-laden 2012 model year lineup also includes the Sportage compact CUV, Soul urban passenger vehicle, Optima Hybrid, Forte compact sedan, Forte 5-door compact hatchback, Forte Koup two-door coupe, all-new Rio and Rio 5-door sub-compacts and Sedona minivan.